Follow the link below to download the Avenza Offline Mapping App on your phone, so you will always be able to see where you are on the map! 3.0 km west from the highway speed change back to 100 km/hr at the west end of Coleman. 9.6 km from the BC/AB border. 4.5 km west from the highway speed change back to 100 km/hr at the west end of Coleman. 8.1 km from the BC/AB border. Click on the Avenza logo below to link you to the app download page. This application is free and works on all iPhone and Android devices. Once you have downloaded the app to your phone, open the geo-referenced Trail Map PDF map above, to download it to your phone. In Avenza Maps, click on the "+" sign to import the map from your device into Avenza. 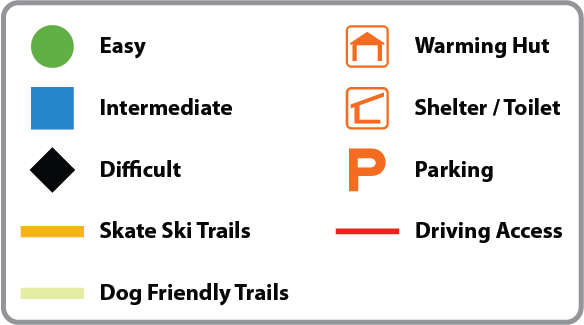 On the trails, when you open the app and select the Allison-Chinook map, there will be a dot on the map at your location. You can also pull up a menu to "Record GPS Tracks", as well as other mapping functions. Maps for Castle Park and Livingston PLUZ area also available for use with Avenza.